How important is it for Oracle to start aligning Java EE with Java SE? According to a recent survey, probably pretty important. See how the future of that hope looks. As some of you are aware, the Java EE Guardians and DZone jointly conducted a community survey to help determine Java EE 8 features prior to JavaOne 2016. You may also be aware that we shared the results of that survey with Oracle before the details of the renewed Java EE 8 scope was announced. Now is a great time to start analyzing those results a bit more. I've already done a high level summary of the results. I've also done a deeper dive into the responses for HTTP/2 and Servlet 4 support in Java EE 8. In this entry I'll take a look at the responses for Java SE 8 alignment in Java EE 8. "Java SE 8 brings a bounty of improvements — lambda expressions, the new date/time API, completable futures, streams, and the fork/join common pool. Many of these features can be used with Java EE 7, but there remains many important missing pieces. In particular, Java EE APIs like JPA, JMS, JSF, and JAX-RS need to be adapted to make full use of repeatable annotations, the date/time API and completable futures. In addition the fork/join common pool and streams currently cannot be safely used in Java EE environments. How important is it to fully align Java EE with Java SE 8?" The following graphic shows how the community responded. Clearly, developers think aligning Java EE 8 with Java SE 8 is extremely important. 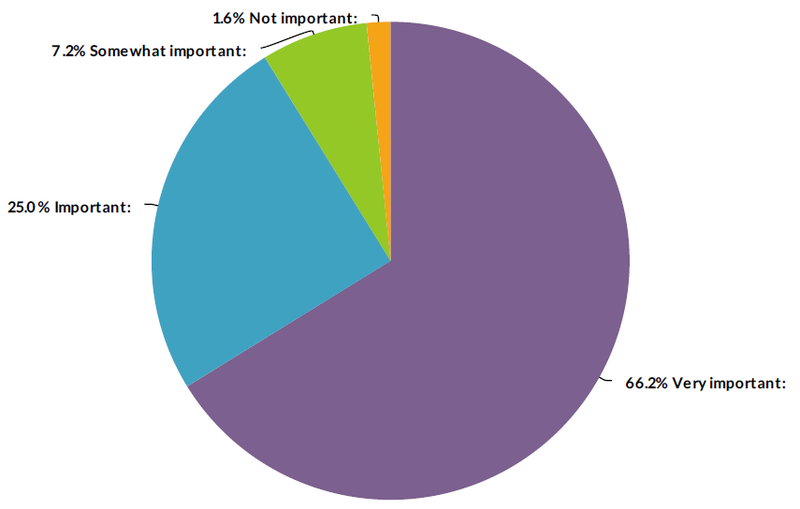 66% said it is very important while 25% said it is important. A mere 2% said it is not important. If you want to learn a bit more about Java SE 8 and Java EE, please do feel free to check out my slide deck on the topic. The deck is focused on how Java SE 8 can already be utilized in Java EE but also highlights clear gaps that can only be addressed through changes in Java EE 8. The fact that developers feel so strongly about Java SE 8 is no surprise at all. 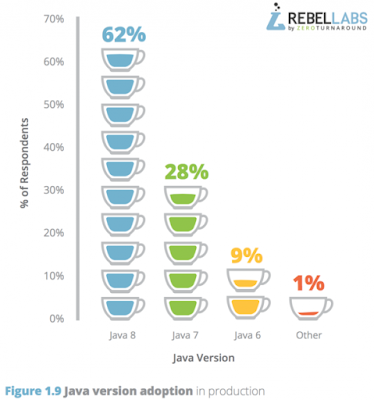 Every reliable survey shows strong support for Java SE 8, including DZone's. The most recent RebelLabs survey shows 62% adoption for Java SE 8 — far stronger and faster than any other recent prior version of Java. Here are some representative comments from participants in the order that people filled in the survey: "Java SE 8 APIs are great," "I've always believed that keeping EE on track with the corresponding SE release should be a very important element of every version," "The changes in SE 8 are a huge improvement for the language. EE 8 users should also benefit from these improvements," "EE should always be aligned with SE," "Java SE 8 brought the next level of language features to Java and everyone must take advantage of it," "This is the most important thing EE 8 needs to do." The initial Java EE 8 charter clearly mentions Java SE 8 alignment as a major theme. Historically, Java EE has always played a key part in bringing Java SE features into the enterprise. A particularly salient example was groundbreaking annotations support in Java EE 5 and EJB 3/JPA. Java EE 5 was the very first mainstream technology to clearly demonstrate how annotations can be used highly effectively as framework meta-data. Somewhat surprisingly, Oracle's own Java EE 8/9 survey did not directly include any questions on Java SE 8 alignment, and they have not specifically addressed the issue either. In practice, at least some of the most obvious Java SE 8 alignment work seems to be moving forward for Java EE platform level common annotations, CDI, Bean Validation, JPA, JAX-RS and JSF. I have already asked for a more coordinated plan and will follow-up soon. If this is an important issue for you, please chime into the linked thread — it's very easy to do. Your Opinion Wanted - What Would You Like to See in OTN Virtual Summits?